540 pages | 47 B/W Illus. Businesses need to become more consumer-centric, efficient, and quality conscious. Yet global competition and supply chain complexity are increasing so rapidly that managers must reach across the manufacturing and service boundary to gather more universally applicable ideas. Vanishing Boundaries: How Integrating Manufacturing and Services Creates Customer Value, Second Edition addresses the unprecedented array of new conditions that today’s business managers must face. The book is a revision of the authors’ previous book, New Methods of Competing in the Global Marketplace, Critical Success Factors from Service and Manufacturing. The concepts underpinning the first edition continue to be relevant today and, in this revised edition, are complemented with coverage of additional emerging issues in today’s business environment. The basic theme of the book is captured in its title and illustrated with the addition of case studies of some of today’s most prominent companies. Present, and potential, role of social media in attracting customers, servicing customers and building network trading partners. This second edition creates greater awareness of the benefits that businesses can gain by sharing techniques and methodologies across the manufacturing/services boundary. The book emphasizes that successful change management requires a holistic focus on three levels of an organization - its technology, infrastructure, and organizational culture. It includes solutions and implementation strategies for risk and crisis management, sourcing, healthcare, alternative energy infrastructure, integration of supply chain services, advances in IT, social media, and customer relationship building. "Vanishing Boundaries presents a coherent approach that brings together the best of manufacturing and service processes to provide solutions that address the pressing trends of the 21st century. 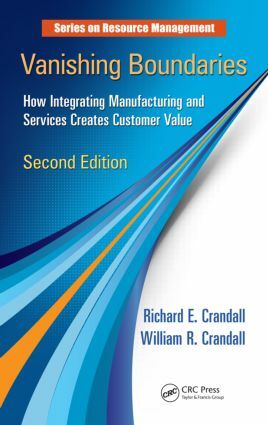 Authors Richard E. Crandall, a professor in the College of Business at Appalachian State University and an IIE member, and William Crandall, professor of management and director of accreditation in the School of Business at the University of North Carolina at Pembroke, have included case studies of manufacturing companies that added services to benefit customers and case studies of service companies that have used manufacturing techniques to enhance their offerings." Why Are Management Programs Important? Where Do Management Programs Come From? Why Are Some Programs Successful and Some Not? Does Your Business Need a Change in Its Infrastructure? What Types of Organizational Culture Are There? Knowledge Management: Where Does It Fit?